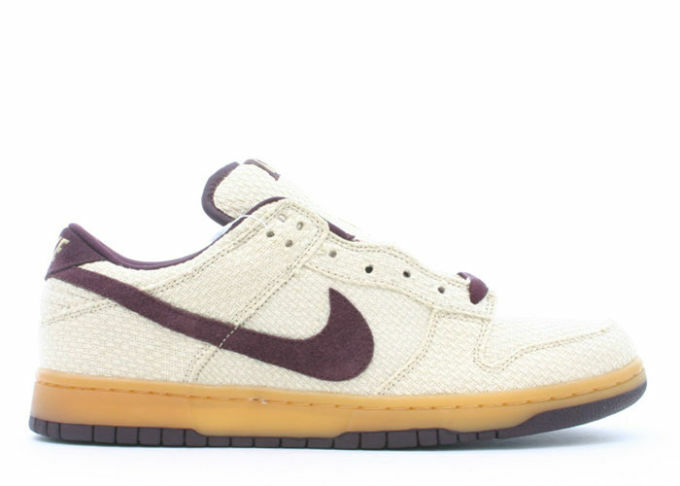 In 2004, Nike introduced SB Dunk Low made out of hemp. Here's the "Red Hemp," which some collectors have deemed as one of the top 100 NB shoes designs Nike has manufactured. Just about every feature on this shoe was made from hemp. 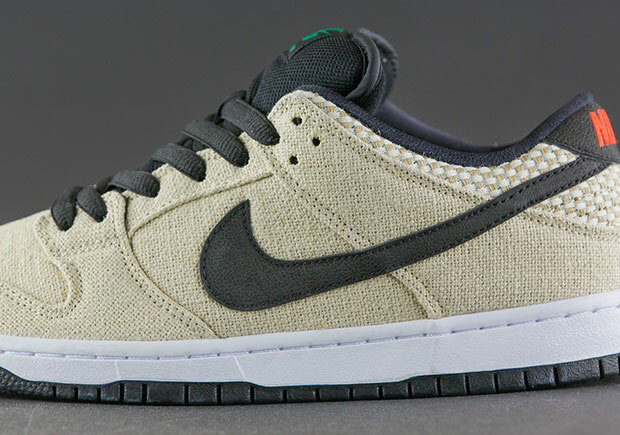 The shoe features an all-textile upper (presumably hemp) in a natural shade of light tan. This product comes at a unique time in our nation's history. You see, industrial hemp is currently being grown in over 30 countries, but the United States is one of few industrialized countries that has outlawed hemp cultivation entirely...but all that could change relatively soon. Currently, millions of dollars worth of hemp are imported every year for American industries. Companies like Nike use hemp fibers in sneakers; our automobile industry uses hemp fibers to produce plastic and car door panelling. In 2014, we spent an estimated $500 - $620 million dollars on imported hemp. The funny thing is, most of our hemp is coming from our closest neighbor to the north— Canada — where the country's 15 year hemp industry banks millions per year in revenue. In the first four months of 2015, Canada exported $34 million worth of hemp seeds and oil. If hemp is such a valuable commodity, why can't American farmers grow it? Why must American industries pay to import something that could be grown and cultivated state-side? We're looking to the 2016 presidential hopefuls to find new ways to improve the economy and generate jobs, so why isn't an entirely new industry like industrial hemp (an industry that makes other countries millions of dollars) on the table? To this day, hemp is classified as a schedule 1 narcotic - right up there with heroin. That means according to the DEA, hemp is just as deadly and dangerous as heroin, even though there is no humanly possible way to get high off of it. Hemp contains less than .3% of THC, and hemp can be cross-bread to eliminate nearly all traces of THC (this has actually been done in Ukraine, the world's fourth largest provider of hemp seeds). Interestingly enough, at a time when American consumers and industries are turning toward hemp products (and American farms are getting smaller and smaller nationwide), our officials have found a way around the DEA by passing the 2014 Federal Farm Bill. Section 7606 of the Farm Bill allows each state to research industrial hemp and determine whether commercial production of hemp would be beneficial for American farmers and businesses. This means that American farmers are now allowed to grow hemp under "agricultural pilot programs." This program came just in time for Kentucky farmers, who were looking for another crop to replace tobacco. As less and less Americans smoke tobacco, the crop has become less and less profitable. Kentucky farmland is actually ideal for hemp cultivation, so the crop is a natural fit and solution. The 2014 Farm Bill is allowing Kentucky to go back to hemp production, something farmers had done in World War II to produce ship rigging, parachute chords, uniforms, and many other wartime necessities. Today, there are 33 states (as well as Puerto Rico) utilizing the 2014 Farm Bill to pass pro-hemp legislation, but the DEA has repeatedly tried to hinder industrial hemp progress. Since the 2014 Farm Bill passed, the agency has confiscated hemp seed going to farmers in Kentucky and Colorado. The DEA did this even though the farmers in both states were already approved to receive the seed through their state's department of agriculture (which is in accordance with the 2014 Farm Bill's guidelines). Kentucky's Department of Agriculture had to go so far as to sue the DEA to get the seed back. Kentucky Republican Representative Thomas Massie was appalled by the DEA's actions and said this at the time: “You can buy a granola bar — in whichever city you’re in — with hemp seeds on it. Everything made of hemp is legal to bring into this country.” Yet, here was the DEA confiscating hemp seeds! In an effort to stop the DEA from interfering with the 2014 Farm Bill (a piece of Federal legislation), the Industrial Hemp Farming Act was introduced in the House and Senate in January 2015 (H.R. 525 and S. 134). If the Industrial Hemp Farming Act is passed, then hemp would no longer be classified as a schedule 1 narcotic. Instead, it would be classified as an agricultural crop and all current restrictions on the cultivation of industrial hemp would be removed. The DEA would finally step aside to allow America's farmers to fulfill America's demand for industrial hemp. Today, Americans can purchase nutritious hulled hemp seeds and hemp milk online and in health food stores; they can purchase lotion and beauty products made with hemp. If the Industrial Hemp Farming Act is passed, then those products could be made in America from American industrial hemp - instead of with hemp from Canada, China, France, Ukraine, Russia, or the many other countries we currently rely on for hemp products. If the act is passed, industrial hemp could become a stable part of the American economy, and American corporations - such as Nike - could rely on American farmers to provide materials sometime in the near future.